Jewelry Archives - Got Giveaways? Jewel Kade Necklace Giveaway (Ends 4/14)! I love handmade jewelry, and I would love to add one of these to my collection! 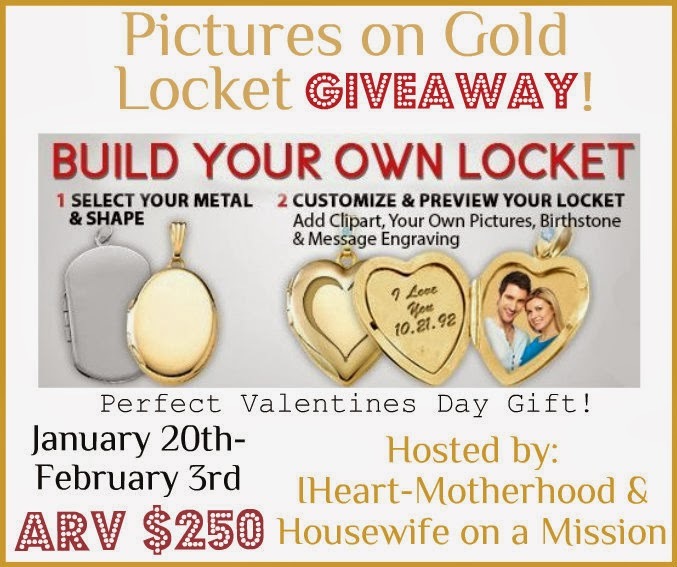 Giveaway – PicturesonGold.com Locket (Ends 2/12)! Welcome to the PicturesonGold.com Giveaway! Hosted by Got Giveaways? and co-hosted by An Exercise in Frugality! Valentine’s Day is coming up, and what better way to show your love for your family than with a photo locket? I’ve been wanting to get a locket for a while now, but I couldn’t decide on exactly what I wanted, so when I got a chance to review a locket from PicturesonGold.com, I was ecstatic! The process to create my locket was VERY easy. I only took me around 10 minutes or so from start to finish. The first step was to pick out clip art for the front. I chose two interlocking hearts, and I LOVE how it turned out! Then, it was time to select the pictures for the inside of the locket. I chose two pictures – one of me and my husband, and one of me and my daughter. I have to say, the most difficult part of the process was choosing the pictures to use! I love the fact that the pictures are engraved on the locket with a laser – it’s SO much easier than having to shrink a picture and then cut it to fit! The final step was to figure out what I wanted engraved on the back of the locket. I did some searching online and finally found a quote by Donna Hedges that really sums up our family well: Having a place to go is a home. Having someone to love is a family. Having both is a blessing. I absolutely LOVE my locket. And, the best part is that I can totally hand it down to my daughter. The pictures and the quote work so well for either me or her! Guess what – one of you will get to build your own locket just like mine! The giveaway will run through midnight on Feb. 12 and is open to residents of the U.S. The winner will have 48 hours to respond before a new winner is selected. Please enter using the Giveaway Tools form below, and good luck! Cady from Got Giveaways? received a product from PicturesonGold.com to facilitate my review. No other compensation was received. All participating blogs are not responsible for prize fulfillment. This giveaway is in no way associated with social media sites including Facebook, Twitter and Pinterest. Giveaway – Pictures on Gold Locket (Ends 2/3)! hosted by IHeart-Motherhood & Housewife on a Mission,and sponsored by Pictures on Gold. Looking for a fabulous Valentine’s gift for the woman in your life? Or, have you been looking for a necklace of your own to represent your family? Here’s your chance to win one! PicturesOnGold.com creates Pictures on Gold Lockets, the finest Photo Pendants and Charms, Gold Lockets, Silver Lockets and other Personalized Photo Jewelry in the industry. They create lasting photo lockets and photo jewelry keepsakes using only the finest 14k gold, white gold and Sterling Silver. Simply send them your photo and using their patented technology, they laser engrave your pictures in color right onto gold lockets, silver lockets, locket charms, as well as custom jewelry. The results are gorgeous gold lockets or silver photo lockets that open to reveal your photos and can be worn as a beautiful photo or picture locket. You will get the guaranteed highest quality with PicturesOnGold.com, they also offer a 1 year guarantee & all items arrive complete with a gift box, perfect for gift giving. So who are you shopping for this Valentine’s Day? Let PicturesOnGold.com create that special & personalized gift for the one you love, you will have a hard time picking a favorite from their extensive jewelry selection! IHeart-Motherhood recently had the opportunity to design her very own locket from PicturesOnGold.com (at no cost). You can read her review here. Buy it: Create your own PicturesOnGold.com Locket online & save 10% off your Valentine’s Day Purchase with code valentine2014! Win it: One lucky reader will win a PicturesOnGold.com Locket! Winner can choose from a silver or 14k gold locket and design the locket to their choosing (engraving, pictures, locket shape, etc.) retailed up to $250!! and ends on 2/3/14 at 11:59 PM EST. Enter to Win a lokai bracelet (Ends 1/24)! The lokai bracelet represents life as it is marked by highs and lows. The bracelet is infused with elements from the highest and lowest points on Earth. A string of clear beads link the two, signifying your own path along the circular journey of life. One lucky winner will receive a lokai bracelet valued at $18. This giveaway is open to US residents of ages 18+. The winner will be contacted by email and will have 24 hours to respond. To enter please use the Giveaway Tools link below. Good Luck! Got Giveaways? is not responsible for shipment of prize. The sponsor is responsible for shipment. This giveaway is in no way sponsored, endorsed, administered by, or associated with, Facebook, Twitter, Pinterest or any other social network.